Hi friends! 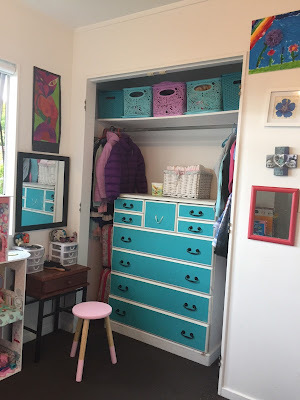 Last week I told you about how I gave a corner of my girls' bedroom a mini transformation to create a writing nook for S. It kinda got me on a re-organising roll, and I decided to tackle the opposite corner of the girls' bedroom by doing something a little crazy. The girls' wardrobe doors have bugged me for absolutely ages. 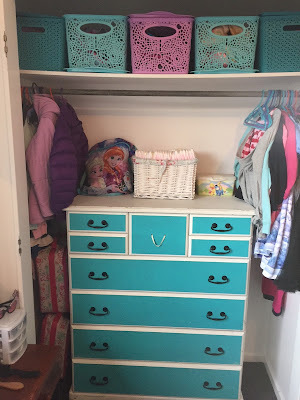 They take up so much floor space to open, and since we keep the girls' dresser in the wardrobe, we were always having to open both doors to get into the drawers. 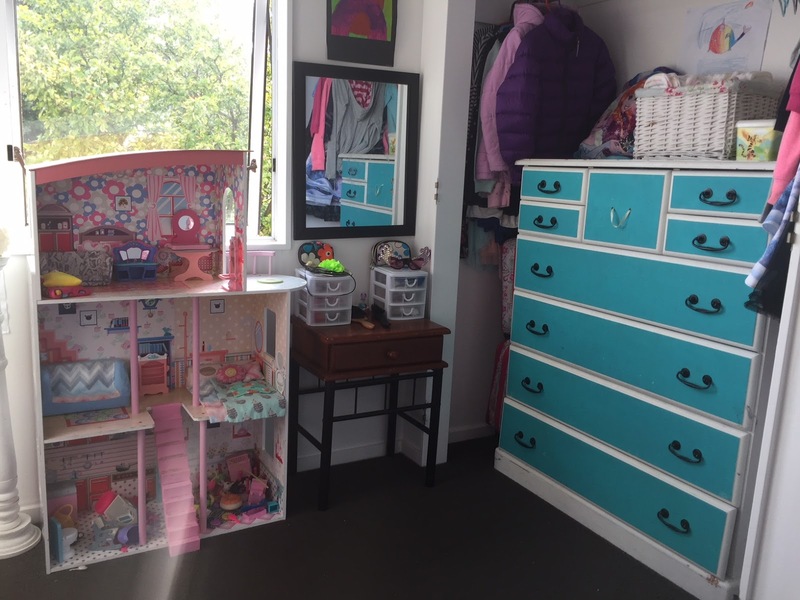 If the girls ever set up a game of dolls on the bedroom floor, we'd have to move everything again just to get into the wardrobe. And we couldn't place any furniture near the doors, or it would get bumped. Since my two girls share such a small room, it didn't seem practical to dedicate such a large part of that room just to doors. 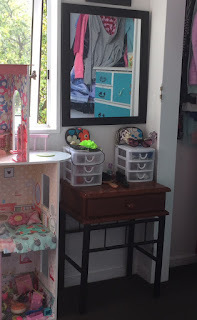 Yesterday S was rearranging things and she moved her little side table next to the wardrobe, under the mirror. It looked really sweet there, like a mini dressing table. I wanted to keep it, but told S it would get in the way of the wardrobe doors. "Let's just take the doors off," S said. "Why not?" I agreed. It's something I had wanted to do for a long time anyway. With a long screw and a hammer, I tapped the hinge screws out and then pulled the doors off. I carted the doors up to the attic, where they can stay until we decide to attach them again one day. 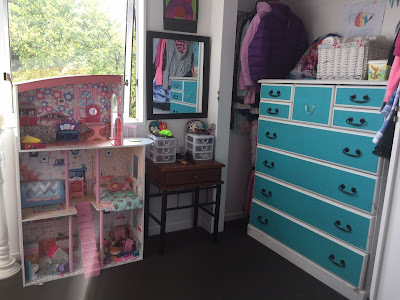 It took all of five minutes to remove the doors and meant the little side table could stay where S had placed it under the mirror. 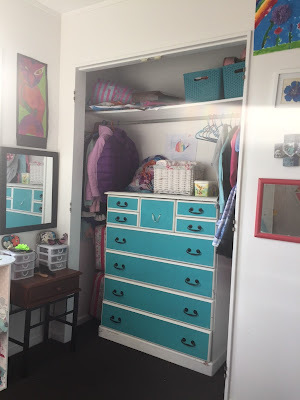 Instantly, the room felt bigger too, since the carpet continues into the wardrobe and makes that space feel like a natural extension of the bedroom. I didn't take any photos with the wardrobe doors in place, because it was a spontaneous project, but you'll just have to trust me on that. 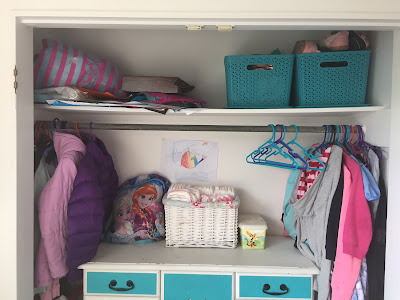 The problem with taking the wardrobe doors off was that we now needed to do something about the mess on the top shelf, since it was no longer hidden behind closed doors. 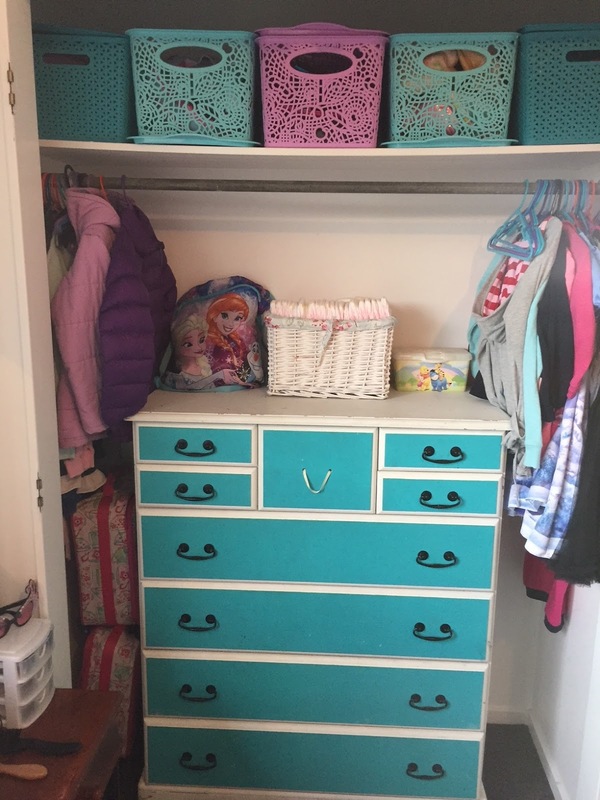 We already had a couple of cute baskets up there, where I kept the girls' spare shoes. I thought it could work to get three more baskets and make a line of them across the top shelf. Today after gymnastics, S and I went shopping in search of baskets. We tried Kmart first, since that's where I got the original two baskets from, but it didn't have anything I liked. I did, however, find a cute stool there that I bought to place in front of the girl's new dressing table area. On our way out of the mall, I happened to glance into another shop and see a rack of gorgeous plastic baskets in exactly the colours I was looking for. I forget the name of the shop, but I snagged three of the baskets. The pink one was the last of its kind. The baskets squeezed onto the top shelf, with a bit of alternating lid action going on, and I think they look really sweet up there. Now the wardrobe area is so much more organised and I feel better about leaving the doors off all the time. Here's the whole area as it is now, with the new stool in place too. 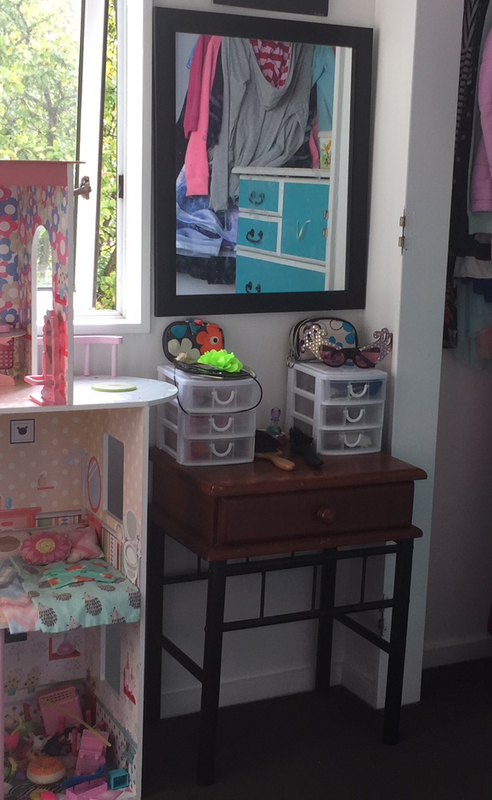 This mini renovation cost just over $40, and has made the girls' small bedroom so much more functional for them. I really need to move the artwork around on their walls too, because it's kind of haphazardly arranged, but I'll leave that for another day. It's time for this mama to rest. Looks great! 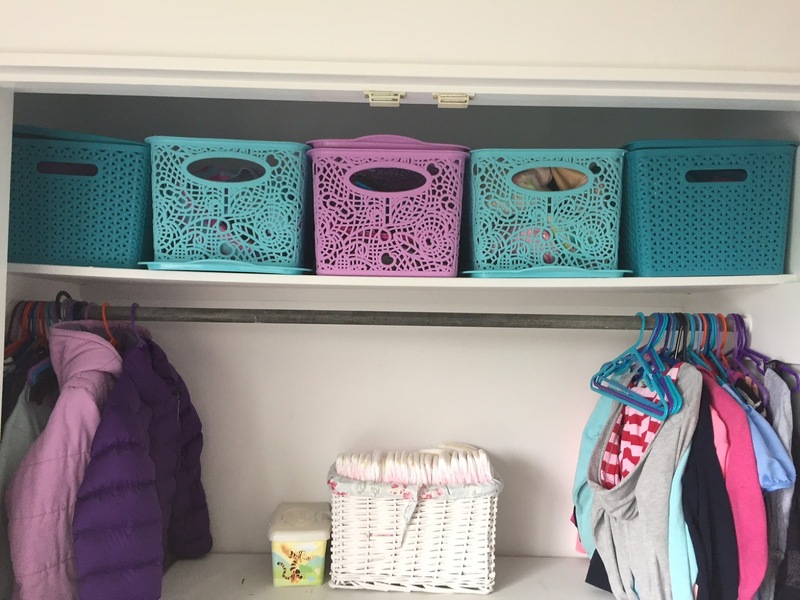 I love using baskets to organize stuff.